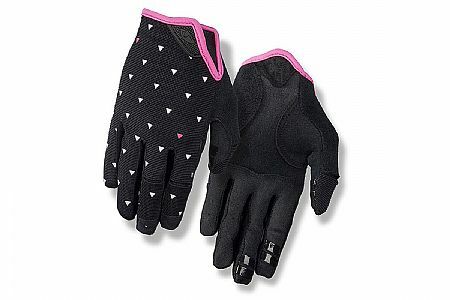 Gloves are snug without being restrictive. They have broken in quickly and easily. The all black is real warm in sunny conditions but dries quickly even if they get sweaty. The fit is great, and they are very breathable. I have machine washed them in a lingerie bag at least 5 times, and they hold up well so far. I gave it 45 starts bc I wish they were at least an inch longer, as I don't like exposed skin between my sleeves and hand. Otherwise, they're great! Love the Giro gloves for both road and mountain biking. The colors are great and the fit is perfect. Excellent quality at a very good price. I commute on the multi-use path along the San Diego waterfront in the early morning (540am) and after work tofrom the train station. These gloves work for this warmer climate, but my fingertips freeze a bit when the weather drops below 48 degrees (which is not often). I like the palm cushion and the lightnessflexibility of the gloves. I bought the polka dots for my wife. She loves them and thinks they are comfortable. The dots match our team kit, too!